The Ester High Friction Film Type TX is a bi-axially oriented, coextruded Polyester film which has a high co-efficient of friction on one side and is chemically pre-treated on the reverse side for better print-ability and smooth run ability on machines. The film eliminates the need for additional and time consuming anti-skid coatings. It finds primary use in bulk packaging. The high frictional properties help in preventing stacked bags from sliding and getting damaged while in transportation or at the retail store. 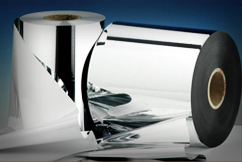 The most common structure is the duplex laminate, where the film is usually reverse printed and adhesively laminated to polyethylene. In reverse printing cases, it is recommended to apply the print to the non-functional surface (non-high friction) so that the functional surface is open to offer stacking performance. The polyethylene film used for lamination should have non-migratory slip additives to ensure optimum stacking performance. This film is available in various versions viz. corona treated and/or chemical coated. It is available in the thickness of 12 micron.